Gina Gershon and Trinity Likins will be playing the mom and sister of Jughead Jones in Riverdale Season 3. Riverdale has found a mom and a sister for Cole Sprouse’s Jughead Jones. BURBANK, Calif. (October 07, 2018) — Fans of Riverdale will learn a little bit more about Jughead’s family in season three, as his mother and sister shake things up with their own sneaky behavior. Gina Gershon (Bound) and newcomer Trinity Likins have been set for recurring roles as Gladys Jones and Jellybean “JB” Jones, respectively. They will debut on Riverdale during the Wednesday, December 12, 2018, episode at 8/7c on The CW. Film, television and stage actor Gina Gershon recently completed a residency at the famed Café Carlyle, where she performed her musical act, Wild Women Don’t Get the Blues. Her television credits include FX’s Rescue Me, HBO’s Curb Your Enthusiasm, Amazon’s Red Oaks, and Lifetime’s House of Versace. Gershon also won Best Supporting Actress at the Toronto Film Festival for Killer Joe, and she appeared in Face/Off, Bound, and The Player. 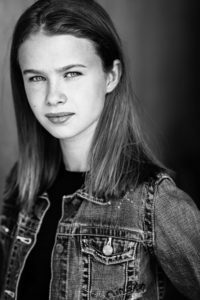 On just her third professional audition, newcomer Trinity Likins landed the lead role of Amelia in the Hallmark holiday movie Christmas in the Air. She also recurred as Emma in the CBC miniseries Unspeakable. Based on the Archie Comics characters, Riverdale is from Berlanti Productions in association with Warner Bros. Television and CBS Television Studios. Roberto Aguirre-Sacasa, Greg Berlanti, Sarah Schechter and Jon Goldwater are executive producers. Season three of Riverdale premieres Wednesday, October 10, at 8/7c on The CW.